‘I’ve got a wonderful flight planned for you’, said the pilot of our Boeing 736 to Houston. His tone was undeniably cheery. ‘Please enjoy it, and please also enjoy the wonderful crew we have on board today’. It was barely breakfast time and love was pouring out of this guy. I wondered whether he was a believer, or whether he’d been swotting up on some self-help books or whether he was in fact on the edge of a nervous breakdown. He seemed so calm and level though, so damn happy, and my own morning grumpiness after a night of zero sleep was accentuated. I was both envious and hateful. How dare he?! As the airplane engines started to roar and the strong sun shone through the windows and reflected off of the wing, I gazed out at the snow-capped Cotopaxi and contemplated my months in South America. Butterflies filled my stomach, feelings of excitement and apprehension and adventure. And a little bit of sadness. Was I ready to leave? 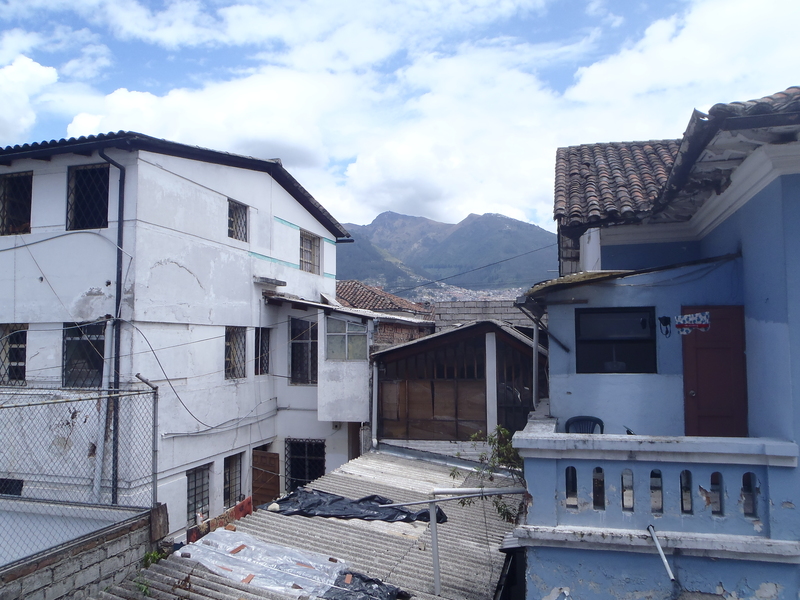 We lifted off, the size of Quito only really appreciated from the air with its dense sprawl of colourful buildings spreading out and up into the hillsides. And somewhere down there was Rosario in Laundry Practika and Luz in Hostel Galapagos and Edith in the Simon Bolivar Spanish School. And all the other people I’ve met in Ecuador and Peru came into focus: Frank and Kelvin at Andes Camp, Sonia of Casa de mi Abuelo, Eran and longer-suffering Chen for being my travel buddies and putting up with my chaos, and so many other interesting and crazy and fun people who shared moments in my journey including Argentinian Juli who hated all the backpackers who ‘just drinking and f***ing’ and ‘I’ve come here to learn something’ Matt and ‘Oh my god’ Miranda, and Gareth from Tourist2Townie and Robin and Avi and Rebecca and Dan and Amy and Hernan and Cait and Pablo and Raz and Matthius and Penny and Alanna and Katey, and, oh so many more. A rich mix of randoms. Gotta love it. 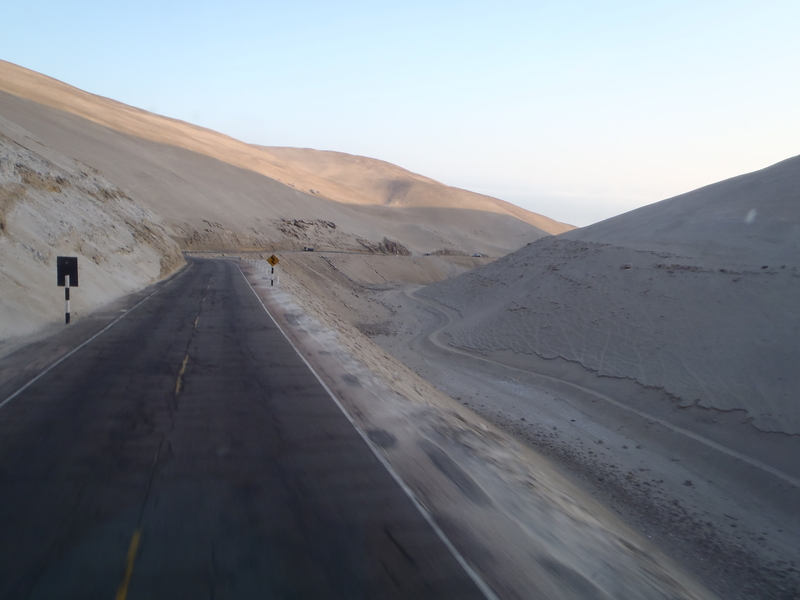 My memories of Peru will forever be linked to colour palette and environment: a yellow, rocky, dusty and inhospitable backdrop of flat desert scrubland and amazing sand dunes that reach high into the sky (the exception would be the jungly area of Machu Picchu, but I’m talking overall impressions here). 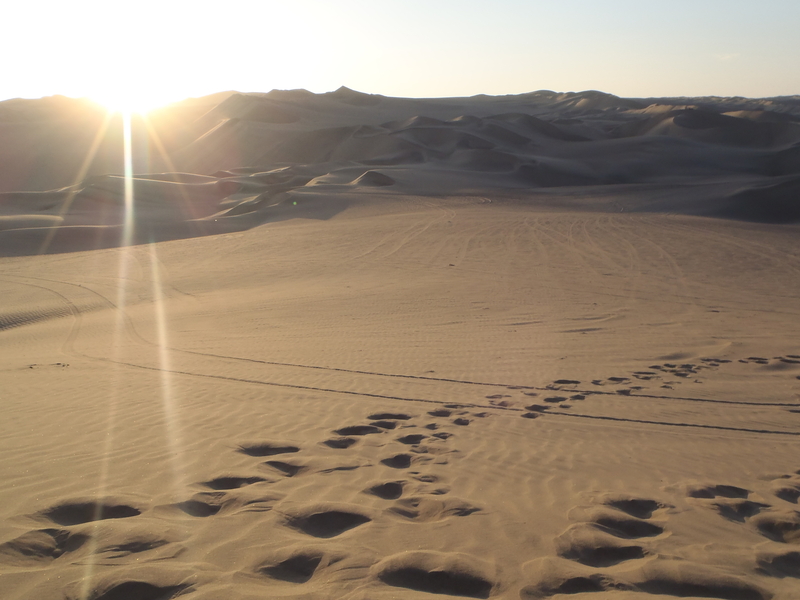 Accompanying the desert landscape was a desert climate: hot and dry during the day, cold and crisp at night when chullos and woolly jumpers were a welcome wardrobe addition (llama patterned, of course). 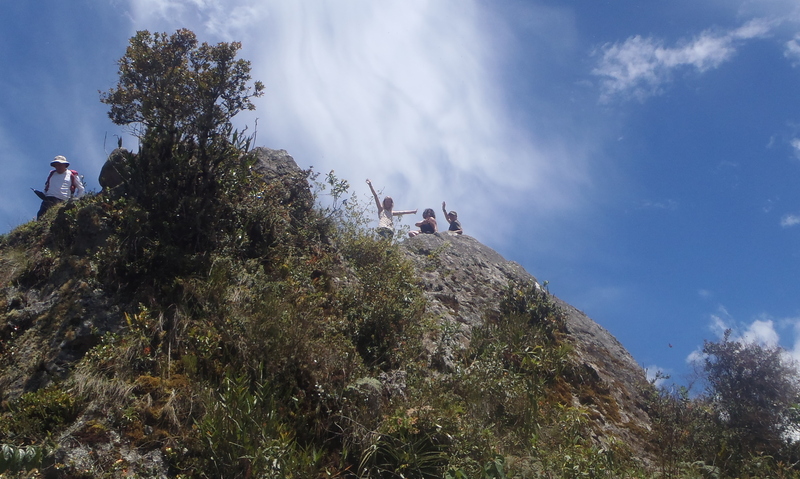 The heights of Peru caused me some problems, although I loved what some of those magical places had to offer. Pasturori and Churup? Wow. Worth every last bit of headache and shortness of breath. 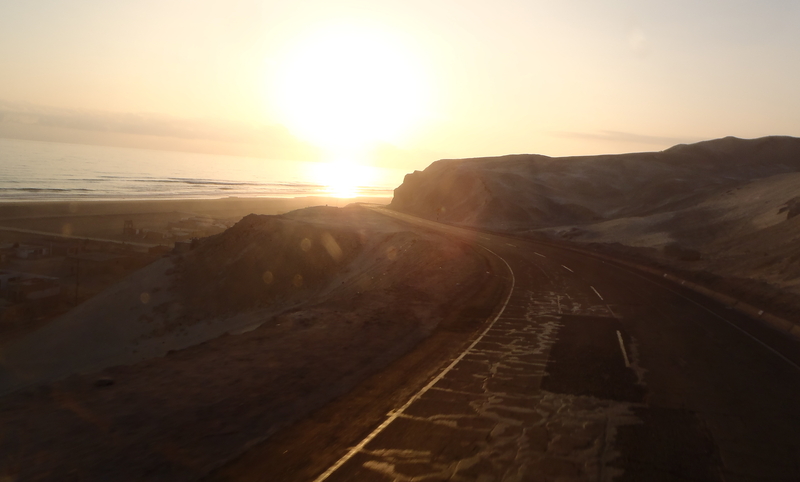 Distances between places in Peru took some getting used to, but before long, a ten-hour journey seemed short-haul. And then there was the luxury bus travel, luxury compared to Ecuador, luxury compared to anywhere I’ve been but costing a relative premium. 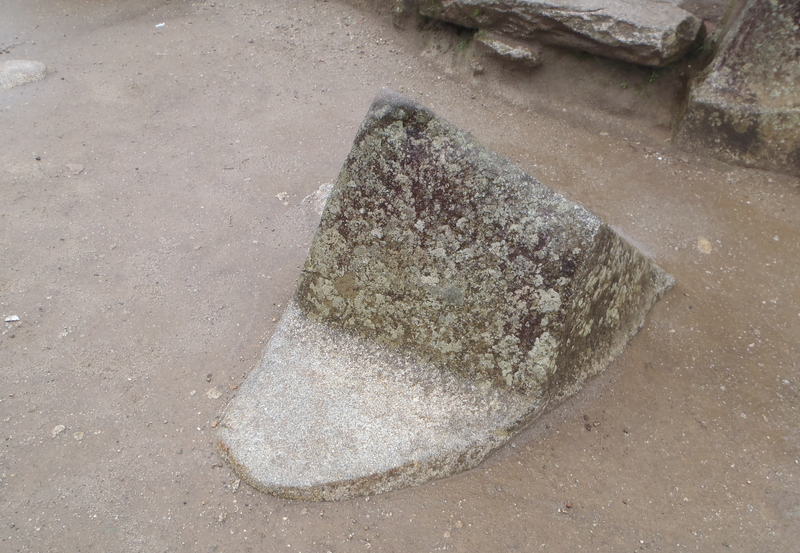 I enjoyed Lima, I could live there, however Cusco grew on me with its straight-talking shoe shiners (‘very dirty your shoes’) and great places to hang out, like Maracuyea and Wachumas and The Real McCoys. But Peru was considerably more hassly than Ecuador, more desperate in some respects with kids sent out to sell sweets and old, shrivelled men making approaches for money, shaky hands outstretched. Poverty and financial disparity were visible here. 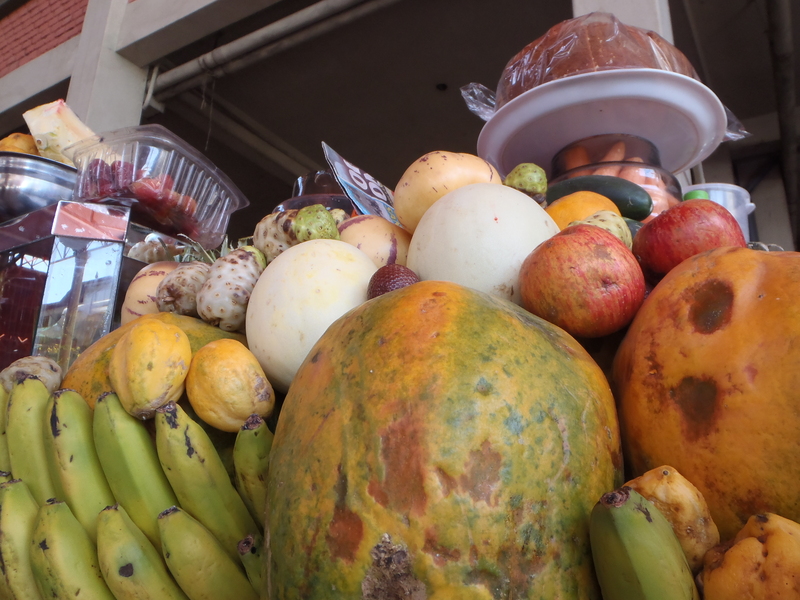 Food highlights from both Ecuador and Peru have to be quinoa and juices of all sorts. It’s official: I am in love with quinoa soup and its wholesome, tasty goodness. I got over my vegetable smoothie phobia, stocking up on vitamins whenever I could by drinking orange and carrot blends (I also tried aloe vera and strawberry, tasty, great option!). 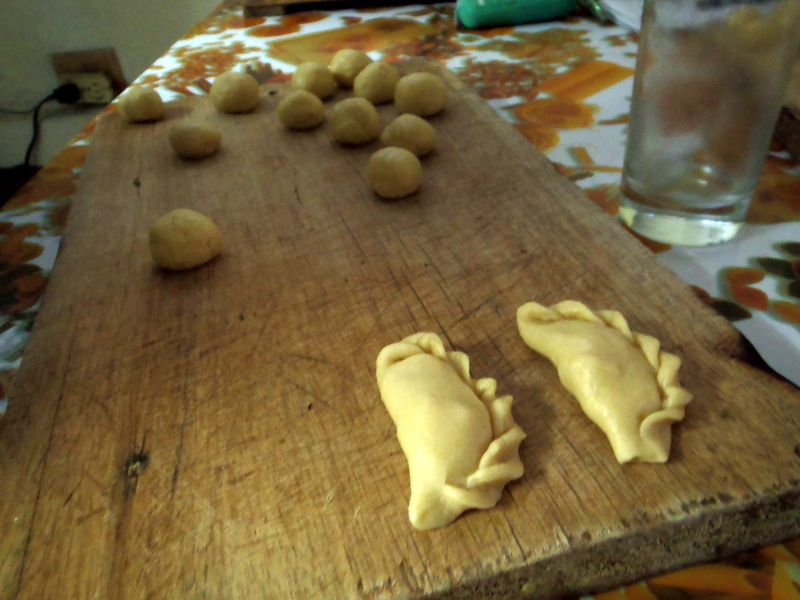 Humitas were another favourite of mine and don’t forget the trusty empañada in all its various guises. Rarely a disappointment, the cheese and sugar combo was a surprise hit for my taste buds. When thinking about South America, music and dancing are firmly in the picture. From a totally biased viewpoint, much of it is pretty bad music – schmaltzy or mainstream pop – that undoubtedly mentions ‘el corazon’ (heart) at some point but will often be so catchy and conventionally structured that the next time you hear it you’ll be tapping and singing along before you realise. Your hips may have even started to sway along to the likes of Fainal or Farruko or Joey Montana. Hola Que Tal* is one of those tracks, truly horrible, but once you’ve heard it for the umpteenth time (thanks Kelvin at AndesCamp) you have some affection for its crapness. 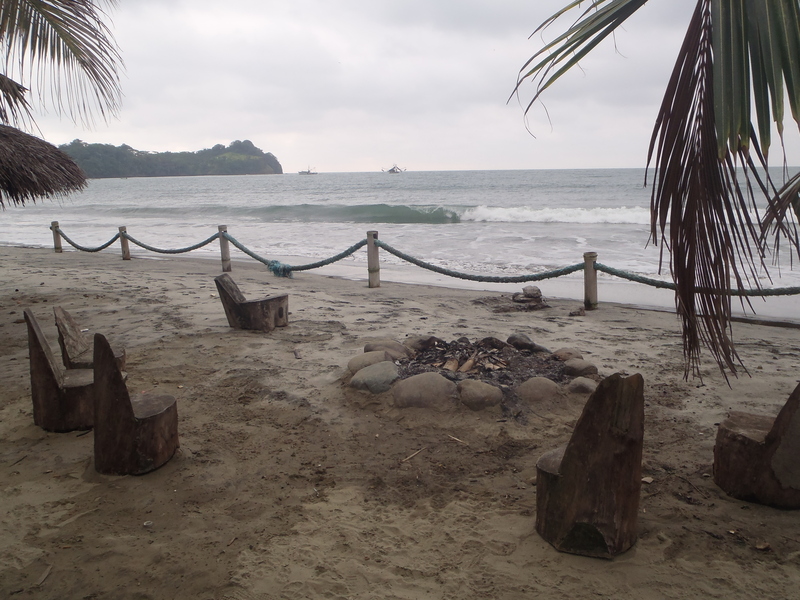 A few comparisons between Ecuador and Peru include the service in restaurants and cafés, which is generally much faster in Peru than in Ecuador. Peru isn’t actually that much cheaper than Ecuador, in fact, much of the time it’s on a par or more expensive. Something I had barely noticed in Ecuador was impossible to ignore in Peru: casinos are everywhere in the big cities and small towns alike. Middle aged men and women sit at slot machines, gambling S/.0.10 at a time to while away the evening. Security guards block the entrances to these places. And although I’ve previously covered Ecuador in some depth, it is a country that will forever be recommended by me as a place to visit. Accessibility and diversity are among the things that make it so appealing. 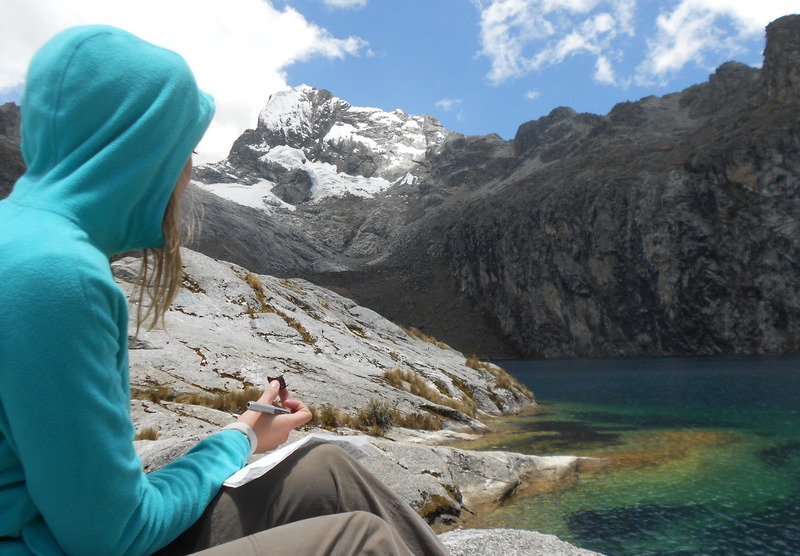 If it were a choice between Ecuador and Peru, don’t follow the crowds, follow the lush beauty of Ecuador. You won’t regret it. So, back to the flight to Houston that’s just left Quito, and I’m feeling that great sense of adventure tingle through my body. The woman behind me pulls down her window blind firmly just as I open mine as wide as is possible. Sunlight streaks in, pushing through the morning mist, highlighting the chains of mountains and marshmallow clouds that we’re now flying high above. What a beautiful day. A fitting ending to a beautiful South America trip. Most travellers go to Arequipa for the Colca Canyon Trek or the Santa Catalina convent. I did as many Peruvians do and went for a one week holiday. I wanted to hang out with a friend, to get over a bad belly and just relax. My stay in Arequipa started badly with yet another tired hostel decision resulting in a damp, dingy room in an otherwise empty place. Situated in the desirable area of Yanahuara on a beautiful, tree lined road across from the bridge – Puente Grau – it had so much potential, but inside it was tired and in the midst of a load of building work (a disadvantage of travelling in low season is that hostels do their upgrades during this time so wires and cables and bricks lying around the place shouldn’t come as a surprise). The next hostel, Bothy Hostel, was closer into town with clean dorm beds starting at S/.18 (£4.31). 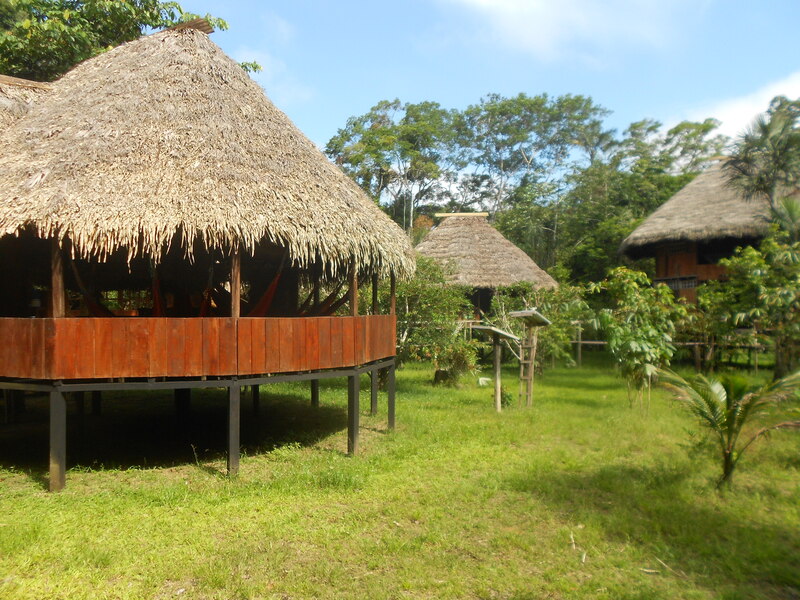 It was much more of a traditional hostel setup, one which I can imagine in high season is a crowded mass of travelling bodies and flirtation with its schedule of party activities and drink deals. 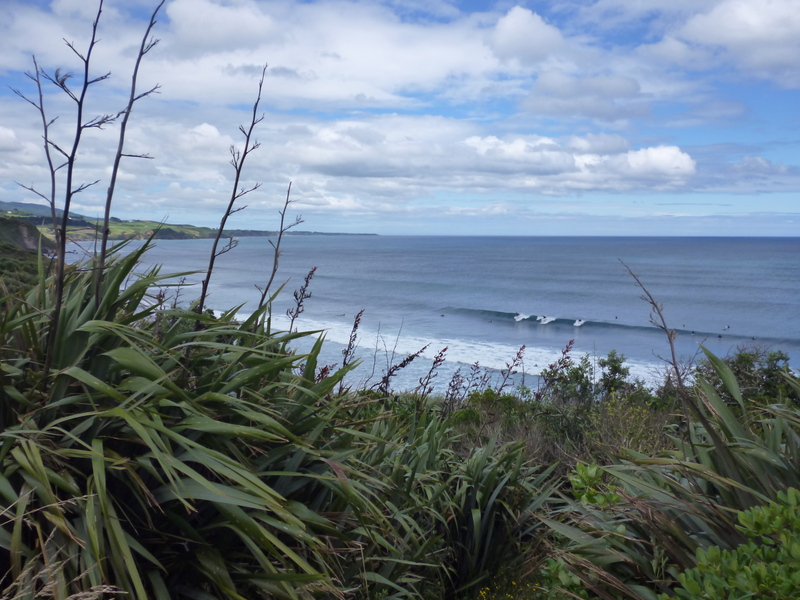 In late November, however, it was nicely populated, enough to be social without the mess. And quiz night and all the other daily activities? Forget it. Nothing to be had in low season. 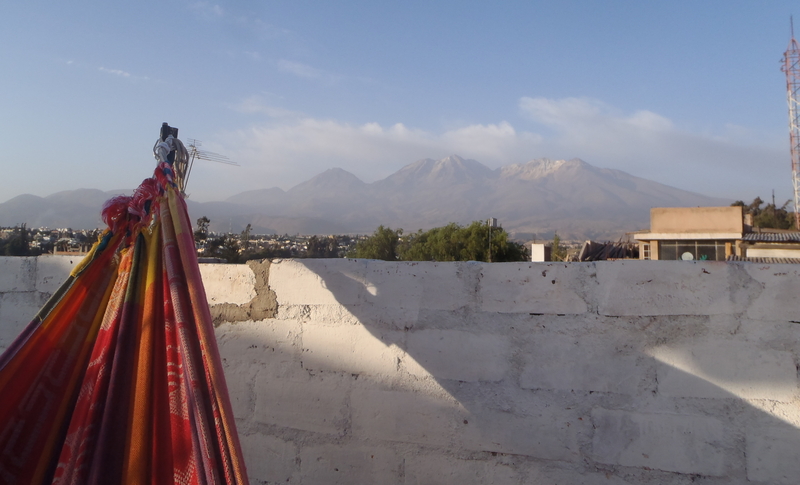 But I truly didn’t mind spending lazy evenings swinging in a hammock on the roof terrace watching the sun set through the haze over the surrounding volcanos. It was more than enough to satisfy my lethargy. 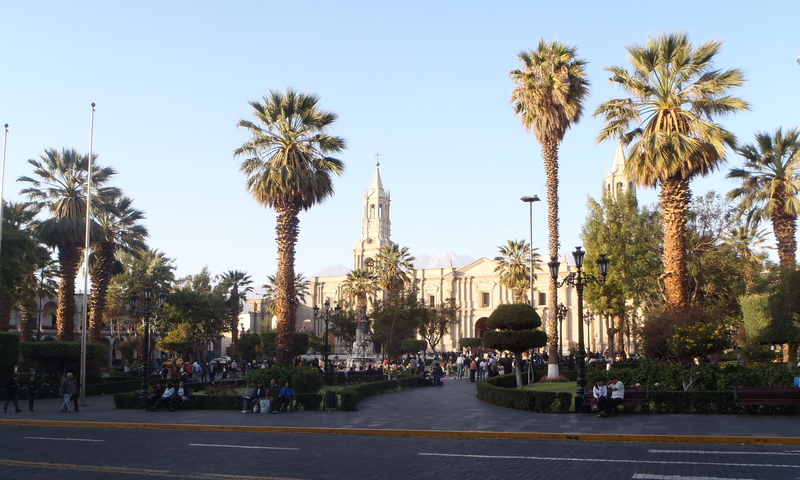 Arequipa, the ‘White City’, feels like a big place and it is: the second largest city in Peru (after Lima) with over 800,000 inhabitants. In terms of infrastructure, to my untrained eye, it appears to be somewhere between Lima and Cusco, obviously a city with big roads and high buildings and shopping malls but mixed with some appealing, cultural elements alongside a little bit of rough. The central area is clean and appealing, two main roads – Santa Catalina and San Francisco – leading up off the main plaza, both streets with appealing architecture and visual pleasantness. Archways into houses spread out into cute little internal courtyards decorated with flowers and colourful paint jobs. These little pockets of prettiness are everywhere. 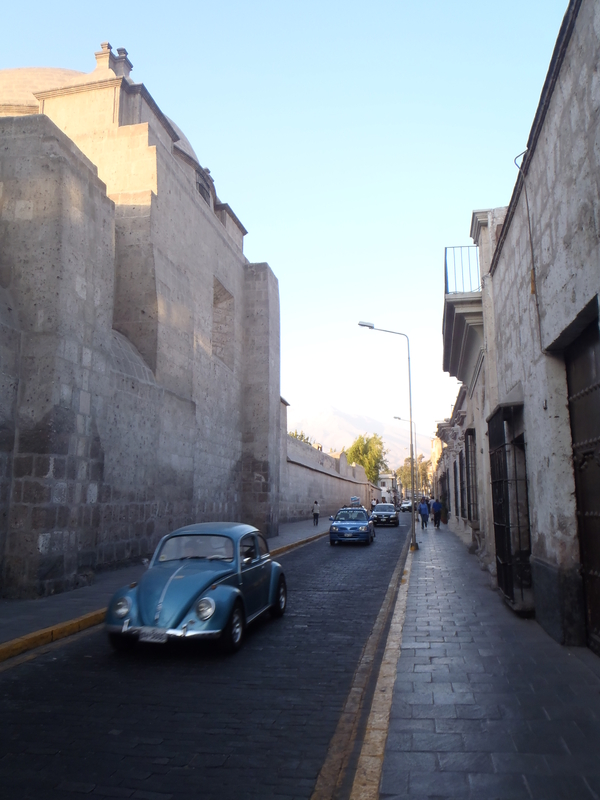 Arequipa, it would seem, works on multi-levels of beauty; look beyond the obvious and it reveals itself to you. Up at the top of San Francisco street is the Plaza San Francisco, a small affair where people sit on the steps in the shadows of the Iglesia San Francisco, seemingly just lounging, little other purpose or rush. I did the same, kicking off my shoes and having a drink. A group of young guys walked by and pointed at my feet and wafted their faces, grinning cheekily. (I know I’m travelling but on the subject of hygiene, I’ve found keeping my clothes clean is not that big a deal in South America with plenty of opportunities to get laundry washed and dried for under £1 per kilo). 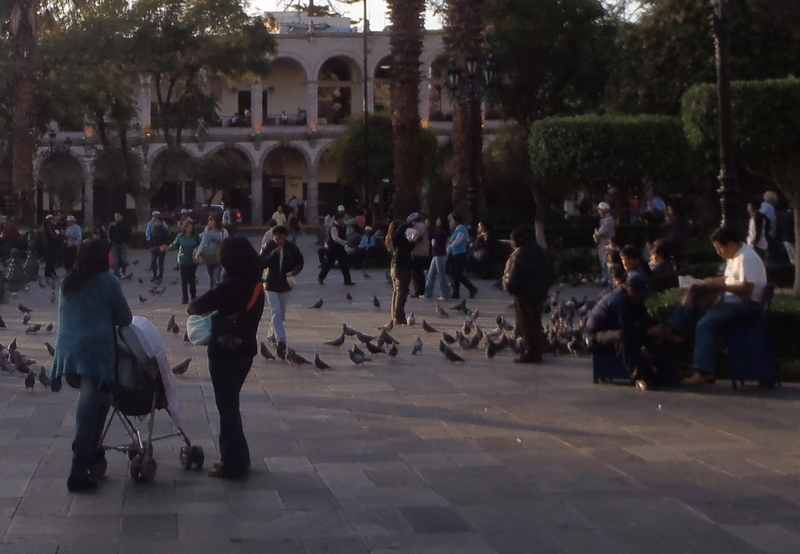 Plaza de Armas is the busiest of any plazas and parks that I’ve seen in Peru or Ecuador. Heaving with people of all ages at most points of the day, I wish you good luck trying to find a spare bench. Pigeons and people crowd the central area, businessmen take time to catch up on the day’s news whilst getting their shoes buffed and polished, and tourists and kids enjoy generous dollops of rich, tasty ice-cream from nearby Artika and Ice Palace. 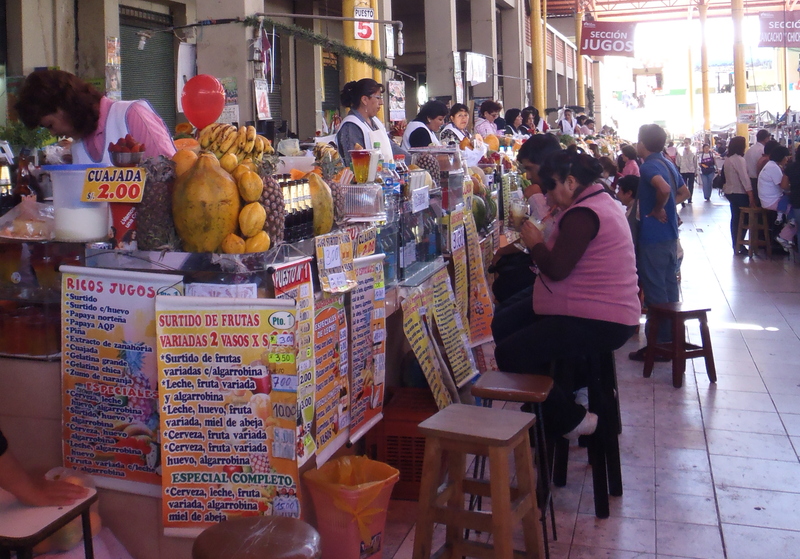 I walked south and east of the plaza, down Peru passed scores of little shops spilling out onto the street until I reached San Camillo and the local indoor market with sections for fresh juices and meats and household goods and more. 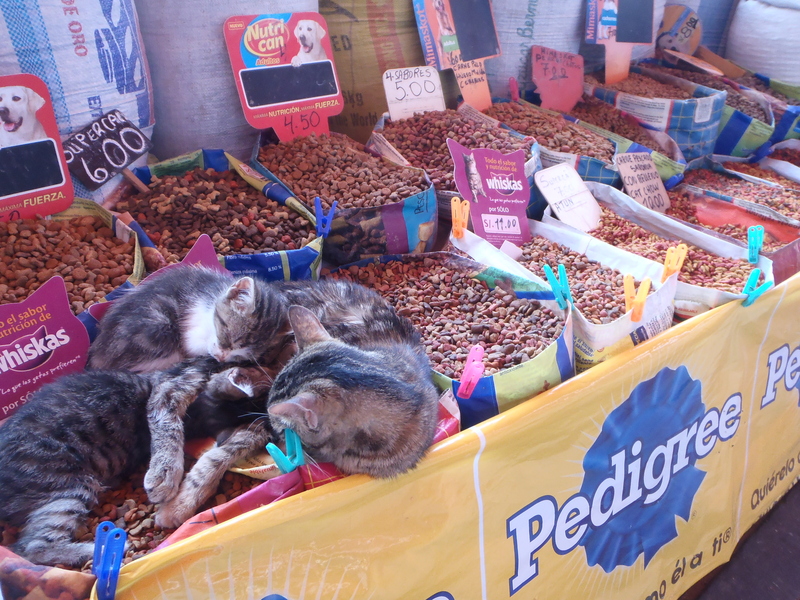 Cats slept cuddled in sacks of pet food, traders scooped out ample servings of caramelised peanuts and police patrolled the perimeters of what is known as a prime spot for thieving. There was very little at the market in terms of artisanal goods, in short, this isn’t a tourists market (there are a few shops around Plaza del Armas and along San Francisco and Santa Catalina that offer the typical Peru t-shirts and llama chullos – woolly hats with ear flaps – and ponchos and postcards). 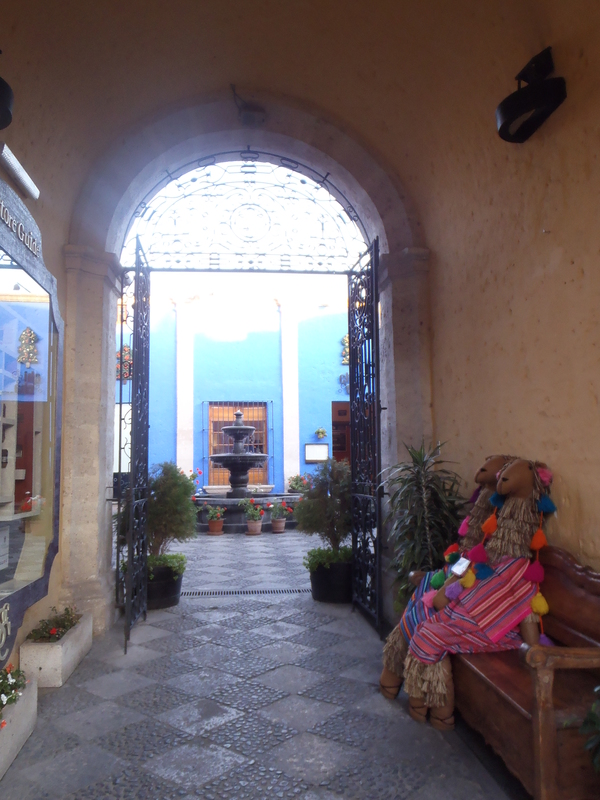 I discovered a penchant for pedestrianised streets and Arequipa centre boasts two lovely options for lazy strolls. Simon Bolivar runs from up by Puente Grau and right down until it merges with Sucre and reaches Iglesia La Merced. Benches and shops and eateries are scattered along the street but nothing is of significant interest. It is quiet, save for when the school children spill out of the colegio and attempt to practise their English on you. The second area dedicated to those on foot is Mercaderes off of San Francisco and Jerusalen. Much shorter and busier with posher shops and chocolatiers, it was the atmosphere that I enjoyed as people strolled arm in arm and window shopped. 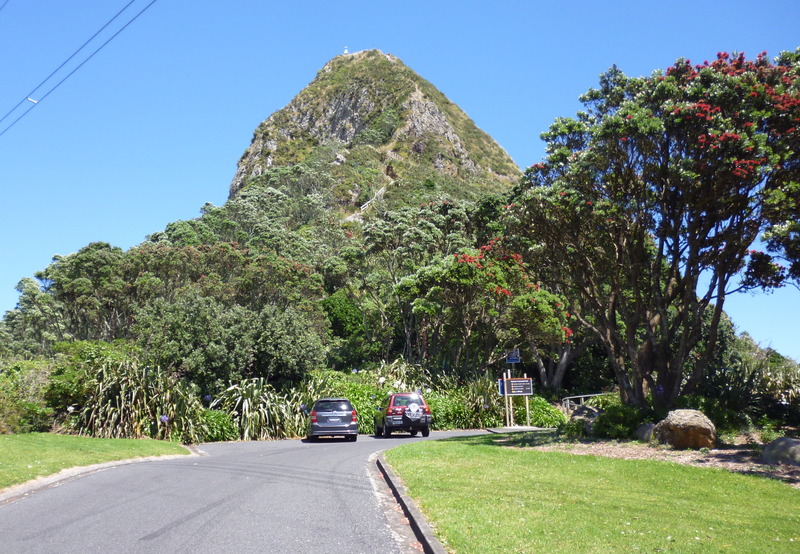 So other than wandering around pretty streets and eating ice-cream and hanging in the parks and plazas and watching the world’s population of Beatles drive by, what else did this lazy holiday entail? I feel a bit of a backpacker travel cheat admitting it, but I also spent time roaming the malls up in Real Plaza and Saga Fallabella up in Yanahuara, and working my way through giant servings of popcorn whilst watching some truly terrible movies. Yes, this could be done in any large city in the world, it’s not a unique travel experience. The way people bought their tickets and watched the film was, well, as expected. Why wouldn’t it be? It was a ‘break-from-travelling’ trip, a week of passively engaging with the high and low culture of the place, and a chance to psyche myself up for the long journey back to Ecuador. 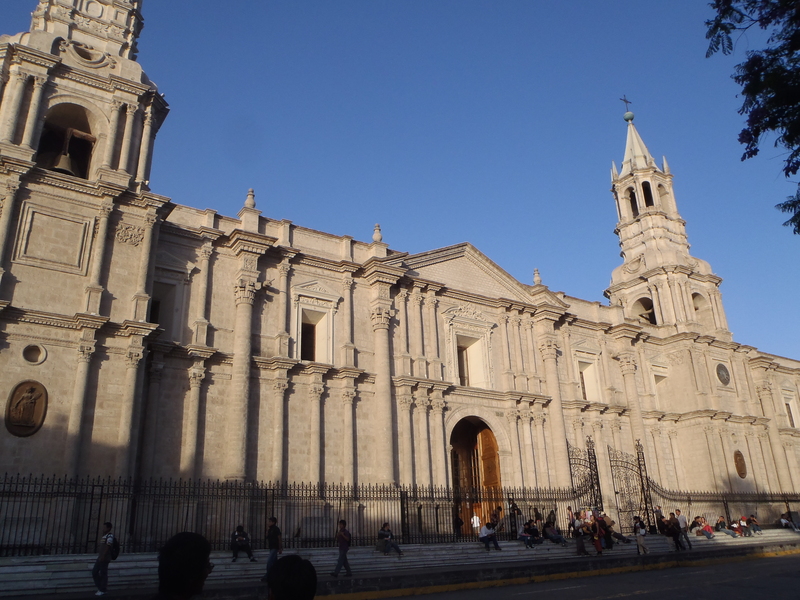 Arequipa as a place to visit? Absolutely. In terms of activities? No idea. 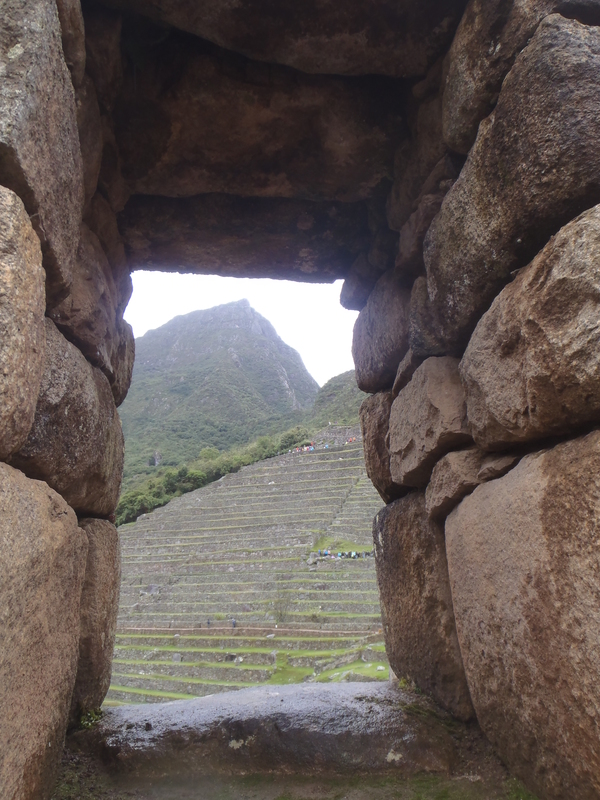 Inca Jungle Trek (Day 4): Machu Picchu and Huayna Picchu, finally! I’m not overly enamoured with traipsing around ruins and have thus far passed up on visiting some places along my route through Ecuador and Peru. I had wondered, for instance, about Chan Chan, but was reassured when another traveller told me that ‘the photos are great, they show it at its best, but when you’re actually there its just a bit boring… and shortlived‘. 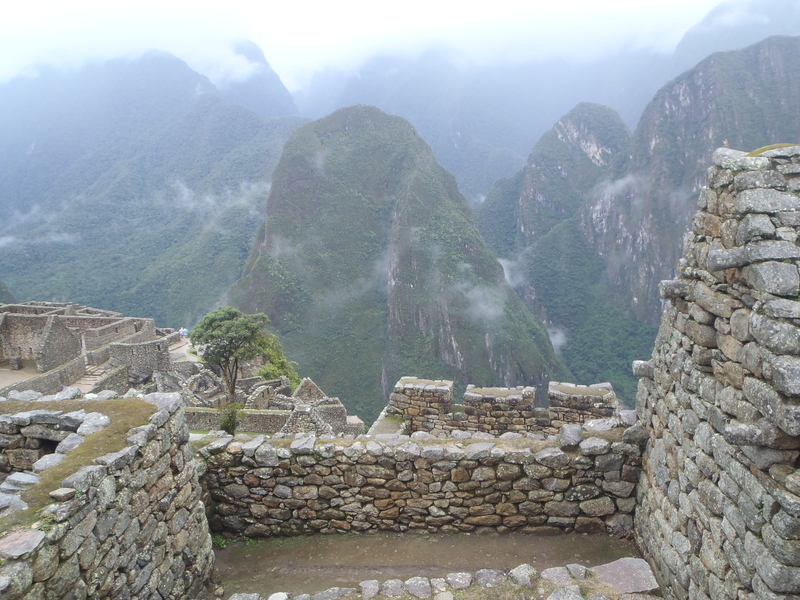 Machu Picchu is, however, a whole different thing: famous, revered, a place of intrigue and cultural and historical interest. And if its good enough for Mick Jagger, who bought up all the tickets for the morning session a few weeks back, well, then it’s more than good enough for me. 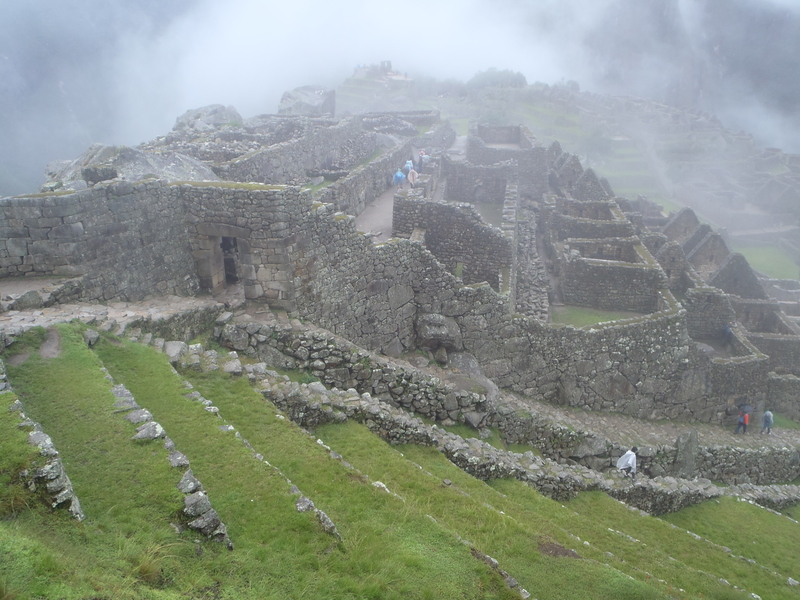 I, along with over half the group, took the bus up to Machu Picchu. Tired and worn down, the 05:00am start was a significant effort. Rain swept the bus windows as we took the winding road up into a lush mountainscape, and I wondered how the others were getting on climbing the many, many steps in these miserable conditions. We all met up by the entrance. They were soaked through but pumped up, physical challenge completed. 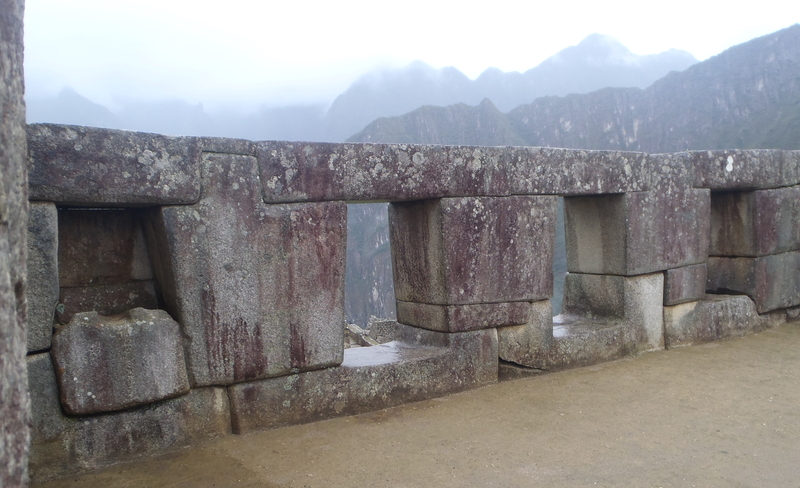 We all headed into the Parque Arqueologico Nacional Machu Picchu, and through misty, mystical wafts of cloud we saw those infamous views, the site of Machu Picchu spread out beneath us; quiet, green, impressive. A moment to be still and breathe and take in the wonder. 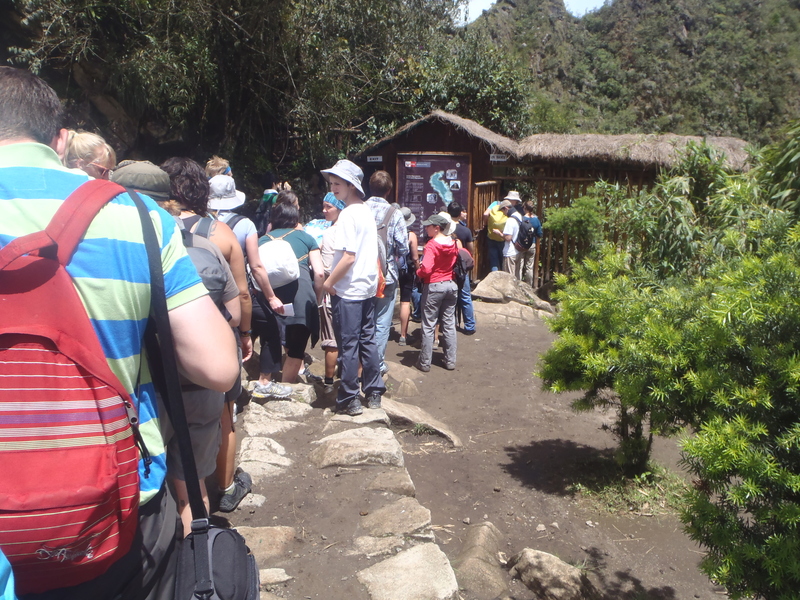 Every day at the Parque Arqueologico Nacional Machu Picchu there are only 400 passes available for those who wish to go to the summit of Huayna Picchu, a one hour climb up from the city ruins. I would recommend spending the additional $10 for this privilege. 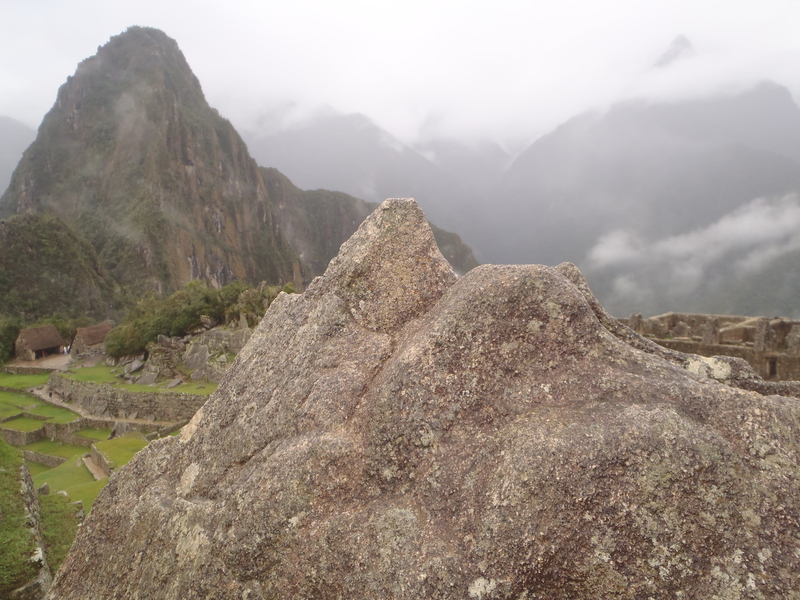 With two available entry times of 7am and 10am, I was in the second group, queuing just as the strong sun broke through, meaning that once I reached the top, all morning mistiness had been burnt off and the views over the Machu Picchu site were wide reaching and breath taking. 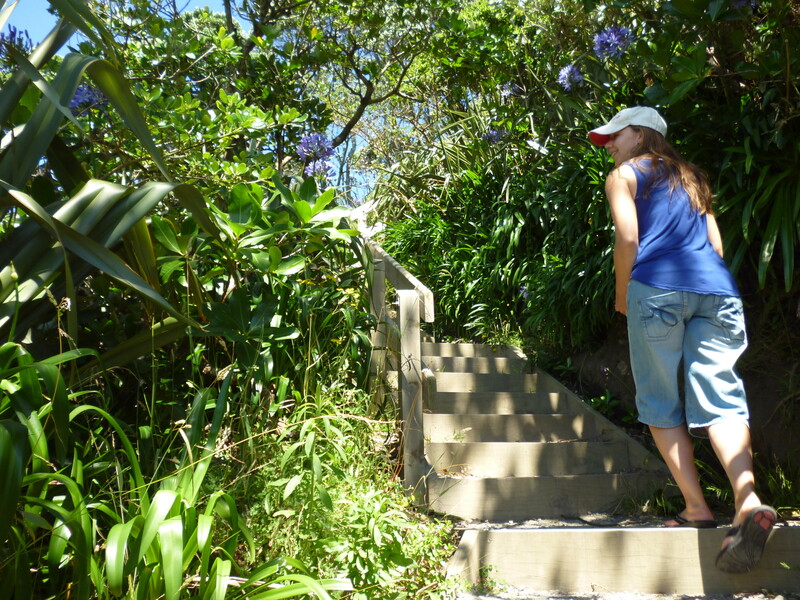 I imagined that for the earlier group it must have been a more awkward climb with wet, slippery steps and less of a spectacularly clear climax. 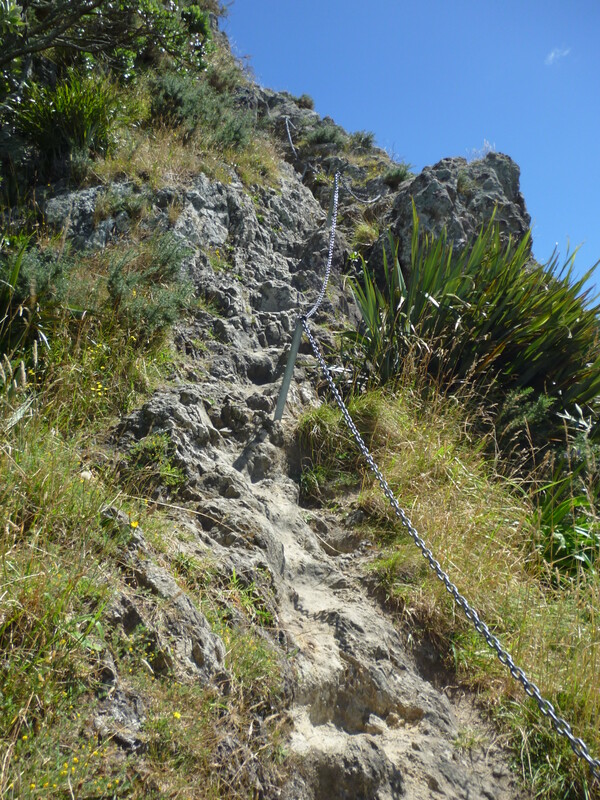 Parts of the climb were difficult and steep and cables bolted into the wall were useful to support or launch yourself up to the next level. One young woman stood crying about half way up, her husband trying to persuade her to continue. 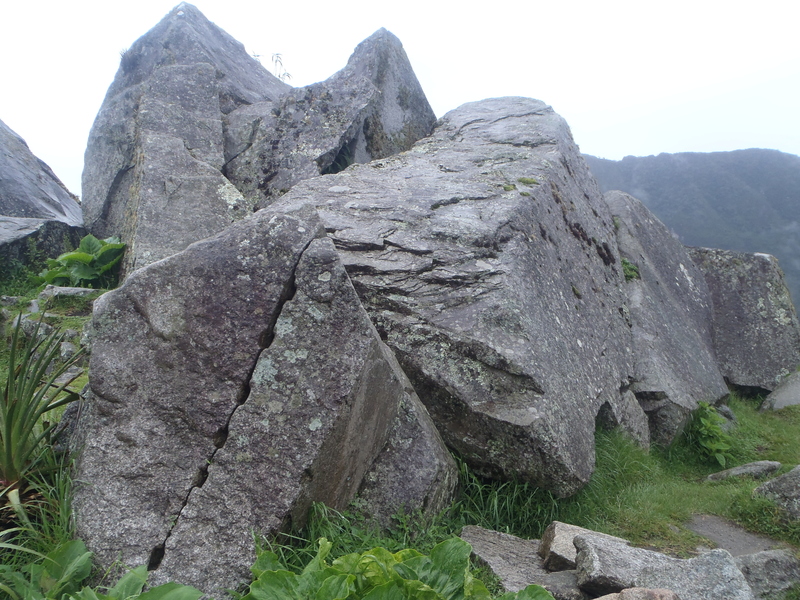 The sign by the entrance had stated: This climb is for the fit and healthy only. A little cave section near the top meant a fun squeeze and duck through chunky rocks before emerging back out into the sunlight, and the actual summit itself was a scattering of boulders inhabited by happy, puffed out people. 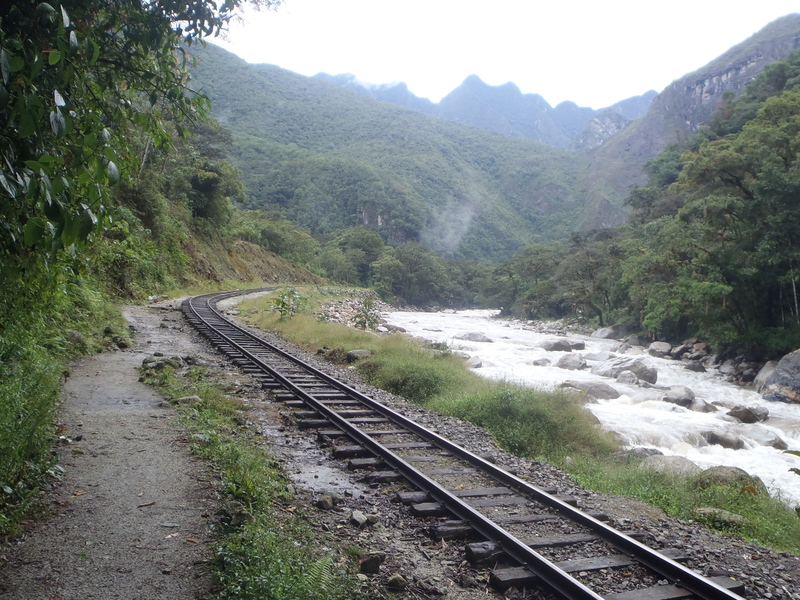 And after Machu Picchu and Huayna Picchu and the whole spectacular jungle trek with all its funny, sometimes scary experiences, we finally departed Aguas Calientes aboard the PERURAIL train heading for Ollantaytambo. A high roofed, comfortable and smooth train with complimentary peanuts and mate de coca and tables for every seat, this felt like a luxury ending to an amazing few days. The feelings of exhaustion kicked in as many passengers on board nodded off, only to arrive to chaos in Ollantaytambo for the final bus ride back to Cusco. Memories and moments that will live with me forever. What a trip. I’ve always wished that I could fly. As a child I loved flying foxes in playgrounds and swings at the fair, as a teenager the rollercoasters that left you dangling facing downwards and whizzing through the air as though free from gravity. Zip lining was something I’d done only a little bit of in the UK, most recently as part of a fun day with friends at Go Ape, Exeter. When given the choice to spend the morning walking for three hours to our lunch spot or going ziplining, well, it was a no brainer. 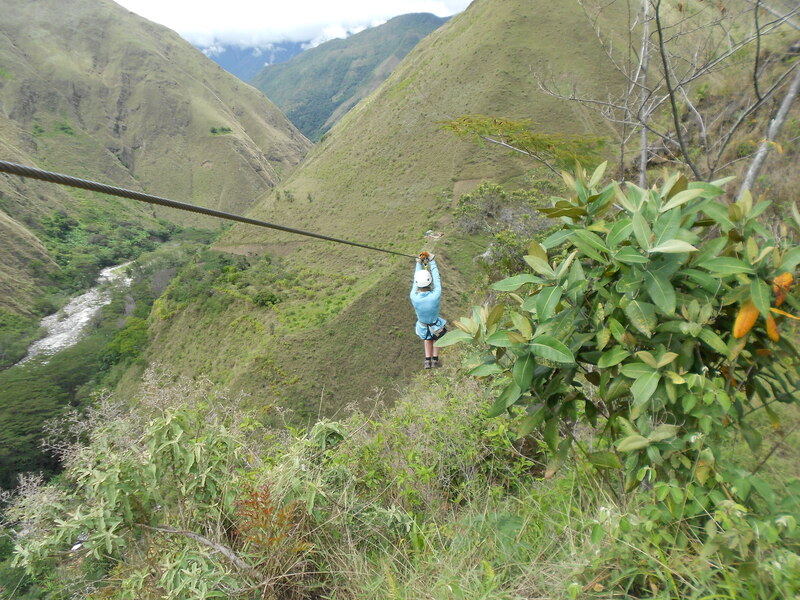 At $30 it wasn’t a cheap option (in Mindo, Ecuador, for example, you can do a similar round of cables for just $10) but this was supposedly the highest canopy experience in South America and I was happy to give my legs a rest. No such luck. To get to the first run involved a twenty-minute steep scramble up mud paths through bushes and trees. People stopped regularly, puffing and red-faced and sweaty in the strong sun. My legs hurt like hell. 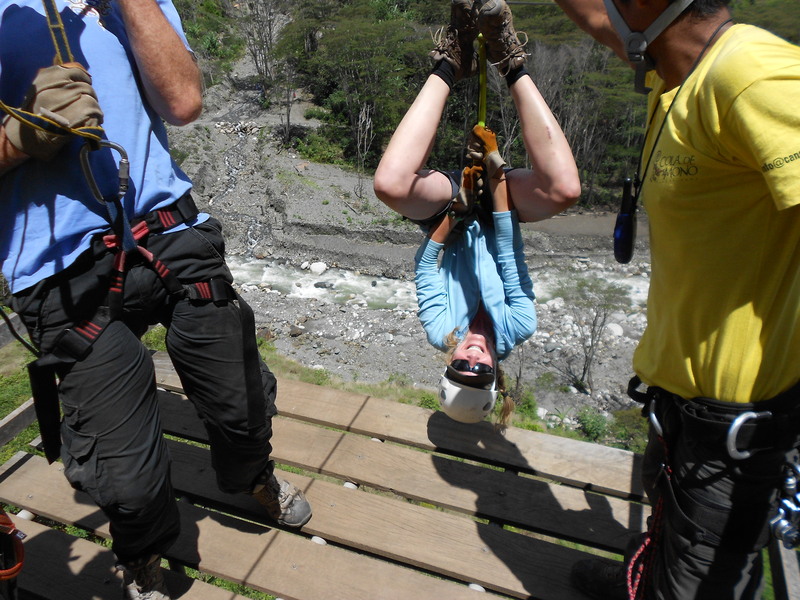 The guys at Cola de Mono Canopy Peru had given us a quick briefing and kitted us out with all the gear. The gloves freaked me out. We were expected to slow ourselves down with our gloved hands by pressing onto the cable. Really?! I expected the worst: sparks and smoke, or at the very least some serious sores to the hands. (Nothing happened). The first run was a gentle start building up to the fourth, the longest, where creativity was encouraged (spin, turn upside down, video, photograph or just cruise with your arms out). On the fifth, the fastest of the lot, I nearly crash landed, mistaking the guide’s gestures to slow down as a sign to stick out my arms and legs. I arrived at the platform full speed, nearly knocking a few people out. It worked out okay, really, some nervous laughs and disbelief but no one was hurt. All good. A bus ride later and we arrived at a little random office in the middle of nothing else near the Machu Picchu National Park to register our entry to Machu Picchu before taking a short walk and climb up to a restaurant in Hidro Electrica. Some people found the afternoon walk boring: a steady pace alongside the rail tracks with little variation in scenery. 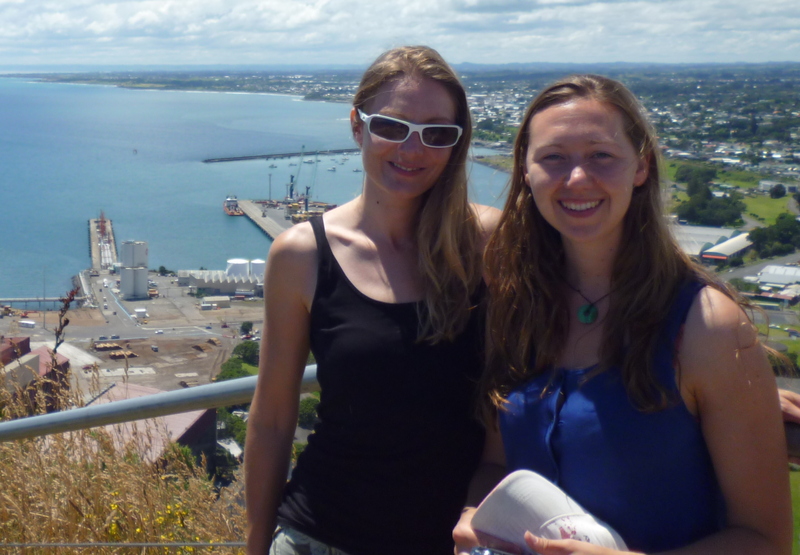 I loved it (even if I did lose the second sun hat of my travels so far). Maintaining the momentum was easy with nothing to cause serious pressure on muscles or joints, and at only 1,000-2,000m, no altitude problems to worry about. Ideal. Sometimes there was a pathway, sometimes just gravel, and sometimes you had to walk on the actual train tracks. 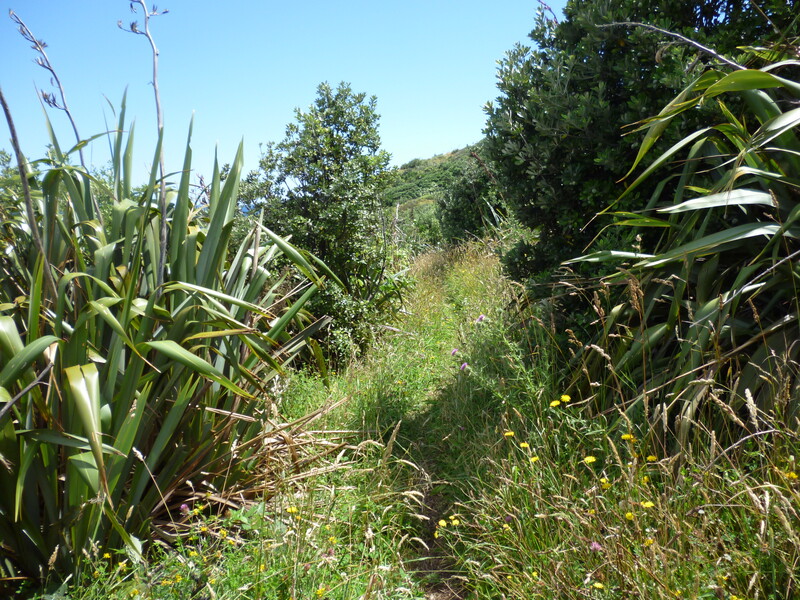 The path didn’t deviate from the track, trees lining one side, lush mountains and a fast flowing river on the other. It was nature at its truest: calm and ferocious and powerful all at once. 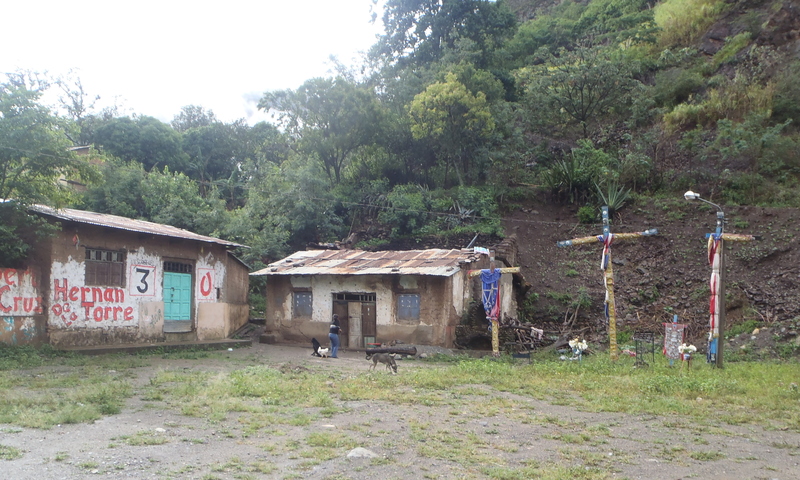 And after nearly three hours, we arrived into Aguas Calientes accompanied by the gentle patter of rain. Supposedly an ugly little town, I was surprised by how much I liked the place. It was dusk and lights shone out of the damp mistiness from a host of hostels and hotels and tiendas that lined the high street. 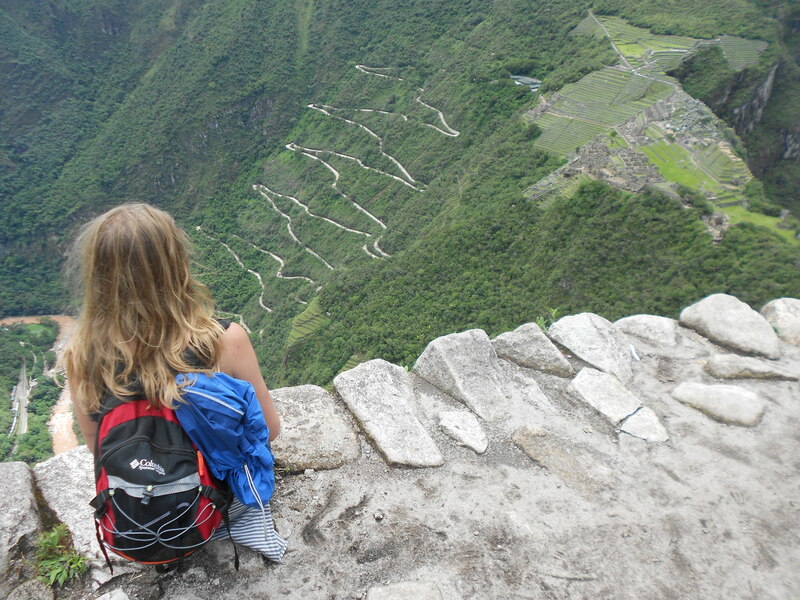 Machu Picchu, I’m ready for you. I love early mornings, I’m just not very good at them. Breakfast was at 06:30am, back in the cafe from last night’s supper, a five minute wade back through mud piles and slop. 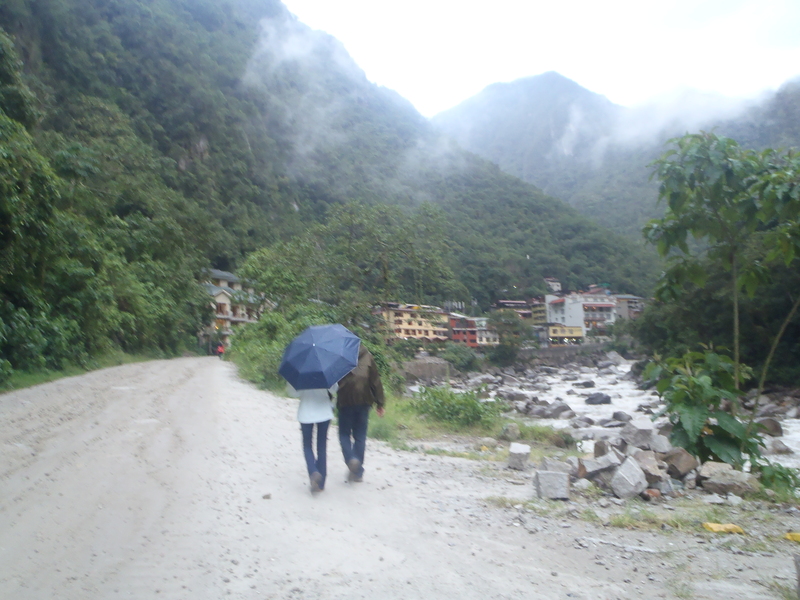 It had rained all night and we were all dreading a full day trekking in constant downpour. It was a miserable prospect, our clothes and shoes still soggy from yesterday. Plastic bags over our fresh socks and we were ready to go. The rain stopped. 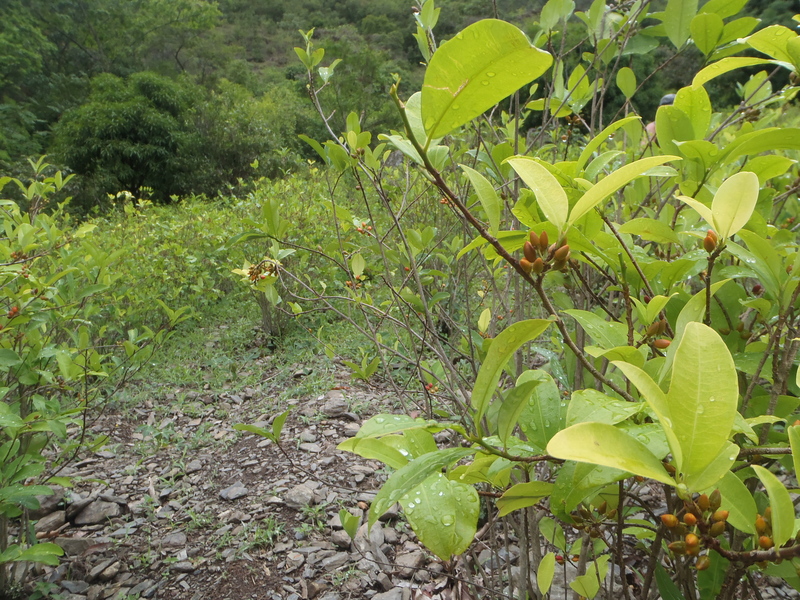 The first hour took us along a track by the flood destroyed buildings of the old part of Santa Maria and the clothed memorial crosses for the dead, and onwards into the jungle along a little pathway framed by coffee plants, mango and avocado trees, and coca plantations. The rain held off. The sound of insects and birds filled the air, and I couldn’t fully understand why some people plugged themselves into their MP3 players and shut out this part of the experience. 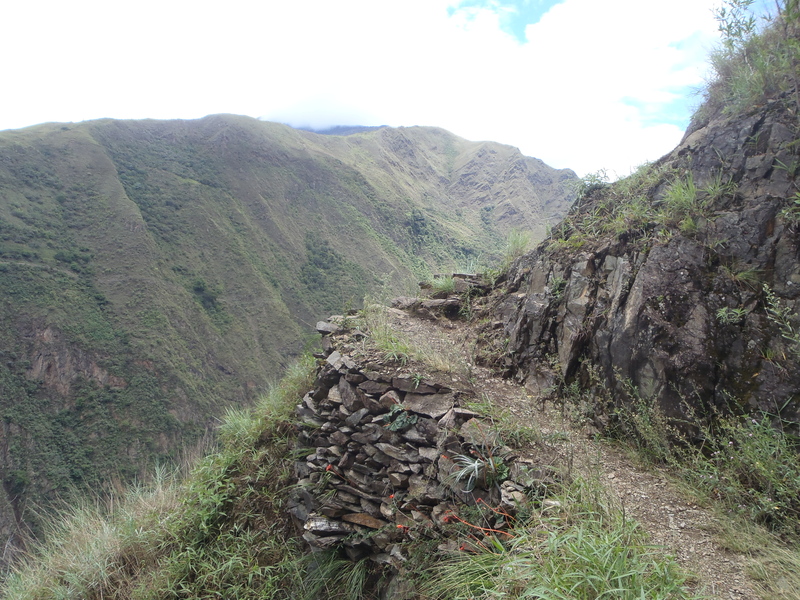 By 09:30am we started to climb, reaching the entry point for the part of the Inca Trail that we were going to trek. After twenty minutes of hiking up steps cut out into the mud, we took a breather, rehydrated and hung out with a crazy, greedy monkey before continuing our ascent. The longer break was at Casa del Mono (Monkey House), a further half hour of climbing and shortness of breath and burning calf muscles. At this point Rodrigo, our guide, showed us a load of local produce including cocoa beans, organic chocolate and achiote (which is used for body painting and food colouring). We got painted up. 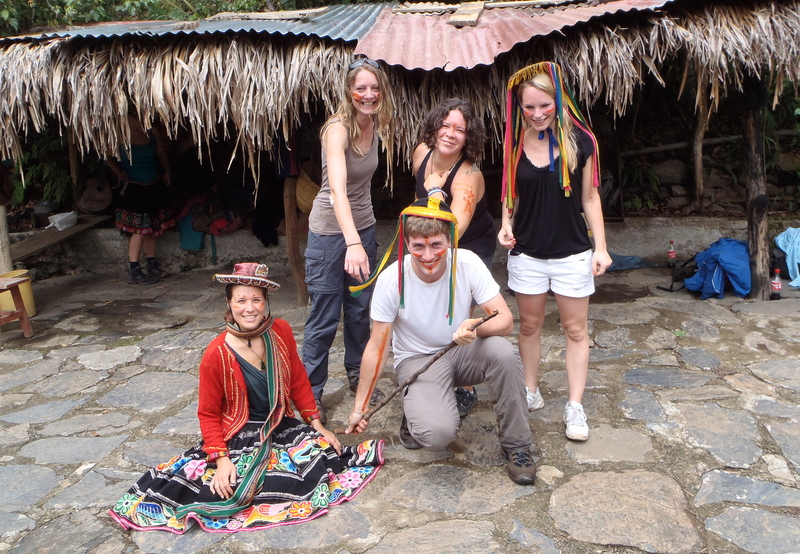 Well some of us did, wannabe Inca warriors. 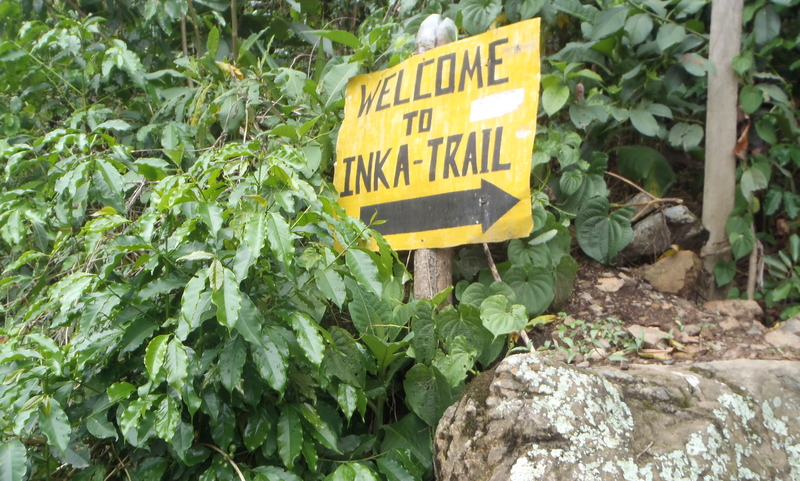 And then we started on the Inca Trail for real, up and down steps and pathways perched on the side of the mountains, winding through woodland patches, by bright, red flowers and over fat stick bridges. The views across the green, green mountains were breathtaking whilst the drops down from the path made you hold your breath and tread carefully. 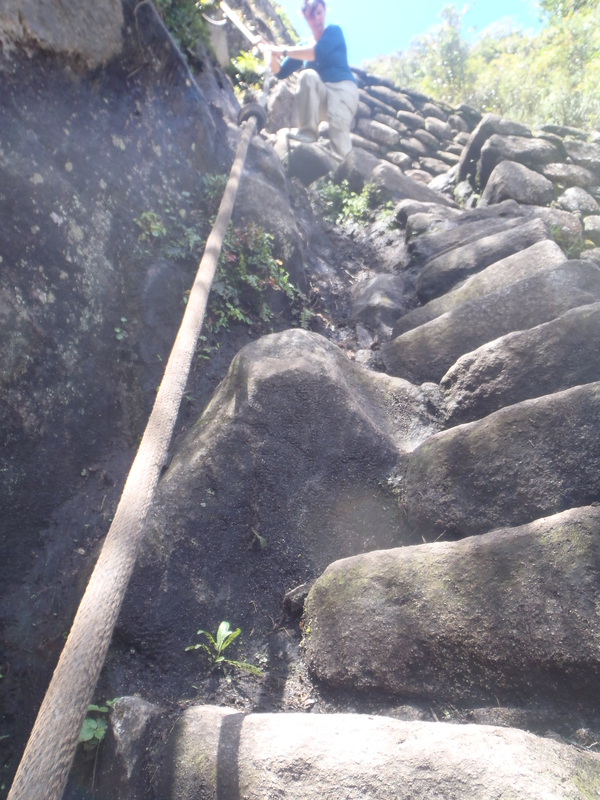 How the Incas managed to run this path, I don’t know, but the magic of this place gave me some energy and I had a spring in my step. I tried to stay at the front of the group, my views undisturbed by human presence and my mind working through a million and one thoughts. It was a calming place to question and battle and deal with some of my demons, nature healing and helping me to make some sense of the world. Self indulgence aside, this section of the trek was a favourite of many of the eleven in my group and even the steep drops down to the valley below didn’t detract from the enjoyment of this path (on many occasions people have frozen, stopped dead and refused to continue out of fear, so, ‘if you have this problem‘, Rodrigo had said yesterday, ‘then I need know now because it is a problem to stop’). 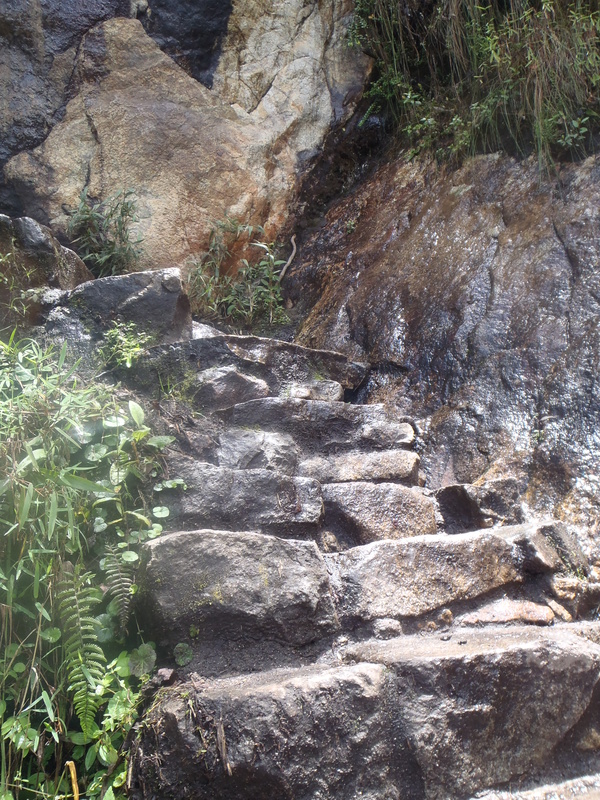 After lunch, we left the Inca Trail behind and wandered along the river bank for a further two hours, a fairly flat and occasionally awkward walk over big pebbles and makeshift pathways that had at times disappeared under a splattering of falling stones. Just before the final steep climb up and down the hillside, we did a river crossing in a man powered cable cart to avoid the rushing, frothy river below. Sandflies feasted on my legs as I awaited my turn, little bloody dots with swollen red surrounds adding further decoration to the prominent bruising from my bike incident. 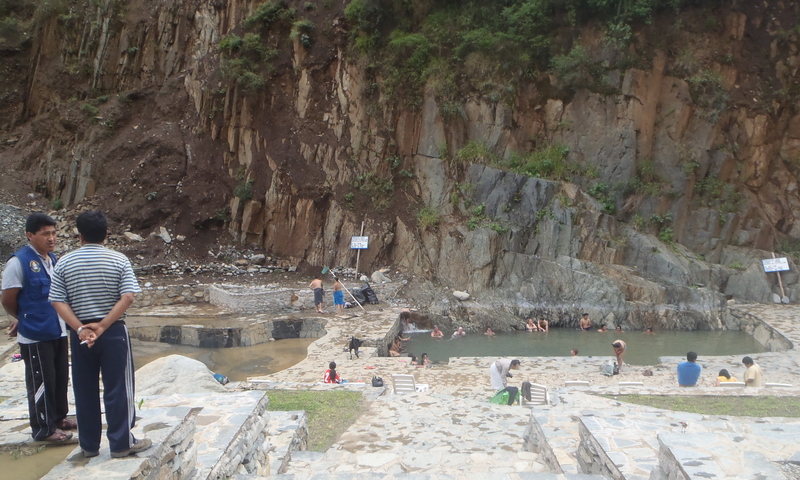 I didn’t join the rest of the group in the hot springs at Santa Teresa. Open wounds in hot, sulphuric water in which people had been lounging all day didn’t seem like the smartest move to me. Maybe it would have been just the thing for a speedy recovery? Food followed not too long afterwards. 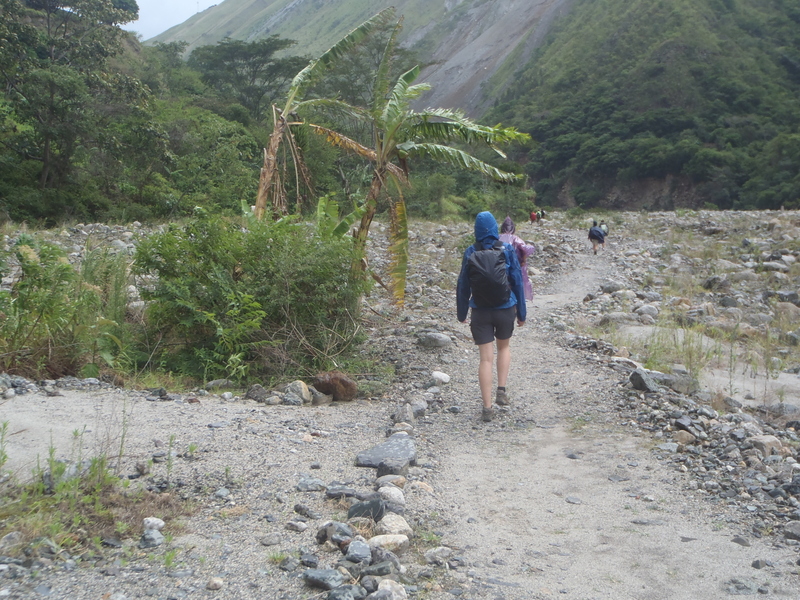 We had been walking for nine hours, a total of 22km over some difficult terrain, and we were a hungry, thirsty group. Briefing for the next day completed, we wandered over to the recommended ‘disco’ which turned out to be a non-starter, so after a few shared beers we all headed to bed. Tired. ´Did you pay the extra for fancy gear?’ asked one of the girls in my group as I pulled on a full face helmet. ´Because we get to wear these ones´, she said, pointing to a pile of standard helmets. ´Nope,´ I said, ´I´m with you guys. Nothing fancy for me.´ I took off the comfortable protective headgear and wandered over to where the majority of the group were gathered. In hindsight, maybe I should have paid the extra for the upgrade. 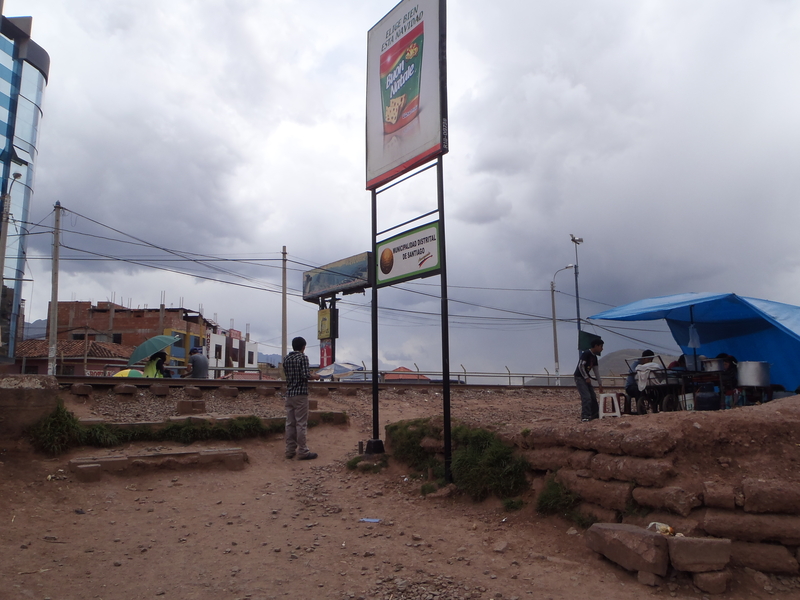 We had spent two hours in the minibus travelling away from Cusco along gravelly roads and through passes cut out into the mountainside. The further we got from Cusco, the more lush it got, huge mountains covered in a dry, dense greeny-yellow blanket, red earthy rock faces exposed intermittently. The road had followed along the bottom of the valley and close to the train tracks leading to Machu Picchu, but once we passed by the busy little town of Ollantaytambo we started to climb into and above patches of misty cloud. The road became yet more windy, twisting and turning back on itself, making for a lengthy ascent. The rain became heavier, adding fat splashes to little mountaintop pools. By the time we reached our intended drop off point at 4,350m, Rodrigo, our guide had pretty much decided that we should drive down a little further to see if the rain would ease lower down. No one argued with him. The driver crossed himself a few times before we started to descend at speeds that would be considered fast on a dry day. Maybe the crossing stopped us from slipping off of the road, or maybe we were just lucky. At the new start point we donned raincoats and got kitted out with helmets and mountain bikes. Everyone also got a reflective safety vest to wear over the top, and it was only as I was flying down the hill, barely able to see for the rain and the spray in my face, that I realised I was without. A second sign? On flatter sections I peddled along, wriggling my toes in the puddles that had formed in my shoes and moving my fingers to stop them freezing up. 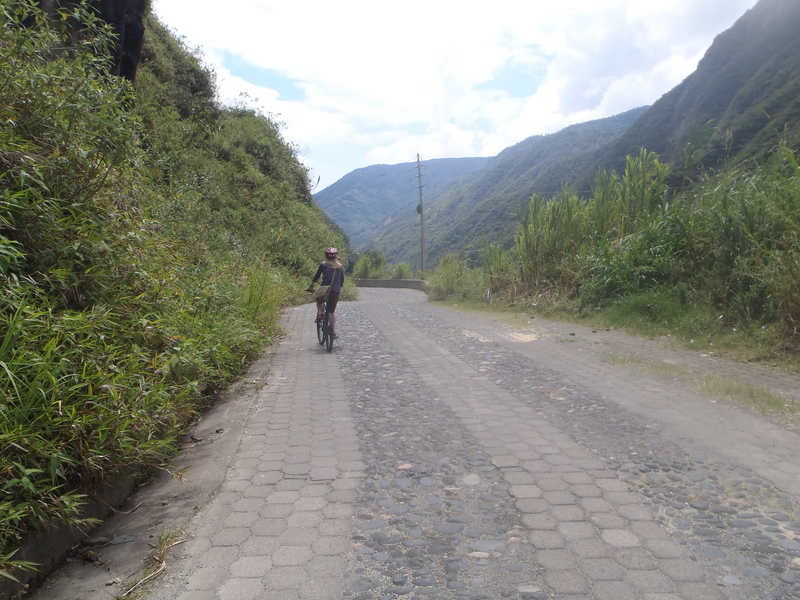 Some people´s brakes were dodgy, another person´s chain was loose, but my bike was tickety-boo. A few people bailed and jumped back in the van that was trailing us, but I was soaked through already and decided to stick with it. Taking corners carefully, I rode on through big pools of water and saw how the runoff from the road channelled down thick concrete drains. One wrong move, I thought, and one of us could fall into there and end up in a mess. A friend was having a few issues with his bike and the support team gave him a hand. I slowed down a little and glanced back to see where he was at… and then everything went slow mo as my front wheel hit the lip and I met the concrete head first. My head bounced about in the half metre deep channel, my face smashed into something, my nose bent and my limbs collapsed, tangled in my bike. I started to move. I could see, my eyes were okay. Relief. I clambered up and out of the ditch and touched my nose. Surely it was broken? And the rest? I could stand. My arms and back were okay. My jaw and teeth were intact. And although there was blood, I was alive. 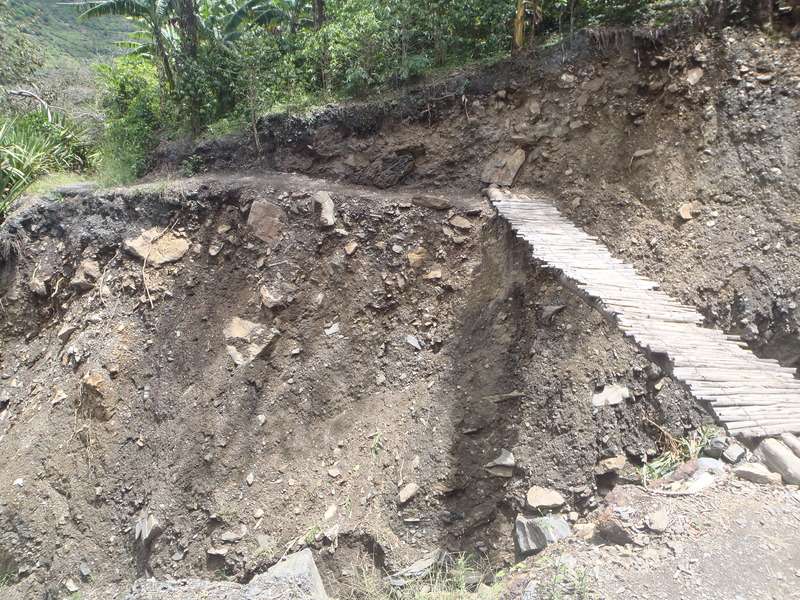 Later that day at the hostel in the little, muddy jungle village of Santa Maria I assessed the damage. Cuts and scrapes on my hip, bit of a mashed up elbow, bruises and deep grazes on my leg, a bit of a headache and sore teeth. And a fat, cut and blocked nose. But not broken. People monitored me for symptoms of concussion and came with plasters and ointments and arnica. I barely knew these guys, yet they wanted to help to make me feel better and to check that I was okay. After a bit of flatness in the week leading up to the trek, it was a little reminder of just how good and kind people can be (maybe too sickly for some of you, but in a moment like this, allow me some saccharine). It could have been so much worse. It was one of those times where you´re reminded of just how quickly your life could completely change. My first thought when I crashed out was ´thank f*** for the helmet´. Without it, this would have undoubtedly been a whole different travel story. That night it took a while to unwind but I finally fell asleep to the sound of rain pattering on the roof and the lullaby of crickets chirping and frogs croaking. What a crazy day.